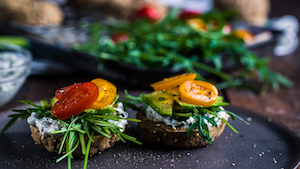 If you’re looking to start eating more raw food, having a raw food breakfast is a way to start your journey into raw, and certainly a great way to start your day. Below you’ll find 5 of our most popular raw vegan breakfasts. Most of them are really simple, but of course the simplest raw breakfast would be to start with a juice or smoothie. Beyond either of those options, we’ve also included one recipe which is a little more involved; the Raw Vegan Bagels. Even though they have a a few steps, the recipe makes 10 and you’re only likely to want 2 for breakfast, so the rest can be frozen. In fact, for or all of these recipes, you can make more than one day’s worth. 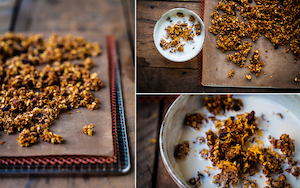 The 5 Minute Muesli and both granolas will make several batches worth. That way you can store them in sealed containers. Even with the chia pudding, you can make 2 day’s worth to make your mornings not just healthy and nourishing, but you can give yourself the gift of time to sit and eat them too. 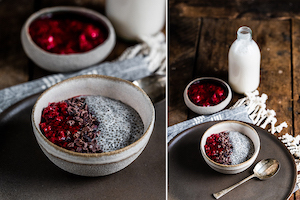 Chia pudding has been around for some time now, both as a sweet treat, or as a breakfast. Chia seeds are packed with nutrition, but don’t have many calories. When you team them up with a nice home made almond milk and some fruit, you have a winning raw food breakfast that you can easily make the night before, in just a few minutes. There are chocolate versions available, as well as versions with a whole bunch of superfoods in, which is great. But I prefer to keep it simple with just vanilla chia, plus the fruit and perhaps a sprinkle of cacao nibs or coconut flakes. These bagels are the most involved of the raw breakfast recipes here. But I can tell you, they are certainly worth it. My suggestion is to choose a weekend where you can have fund making these and enjoy them for Sunday brunch. They’ll freeze really well too, so as the recipe makes 10, you’ll be set for a few weekends in a row. Don’t skip the cashew cream cheese either. It’s simple to make with a bit of direction (see the video) and really makes the bagels. When you top all of that with some greens, tomato and avocado, you’re set for one heck of a start to your day! Oh boy. A breakfast based on a dessert. This is such a tasty and comforting breakfast that can be made in big batches and kept in glass jars for many weeks. I love the mix of spices in this one. Team that up with some ice cold almond milk, perhaps even some vanilla almond milk, and you’ve got an absolutely delightful start to the day. Everyone likes a breakfast that’s quick to prepare. Although I absolutely recommend making time for yourself in the morning, to be able to sit and eat peacefully and mindfully, I see the benefit of being able to whip something quick and simple up, or even better, have it already prepared. This Five Minute is exactly that. A splash of almond milk and you’re ready to go. In the the picture, you’ll see the milk looks a little red. That’s because I blended it with goji berries, for an extra superfood hit. 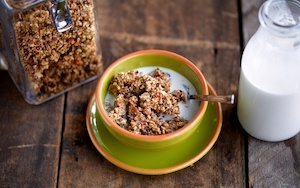 Our second raw granola on the list is this Hemp Granola. Hemp seeds are a great form of fibre, protein and fat, so are a really wonderful way to start off the day. This is another raw breakfast recipe that can be dehydrated ahead of time and stored for weeks in a sealed container. 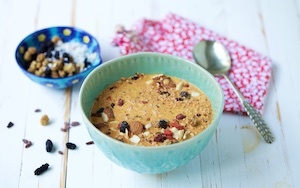 You’ll see a few other superfoods in this recipe too, such as lucuma, goji berries and protein powder. If you can’t get those, or just don’t like the sounds of them, you can leave them out or replace them with your favourites.